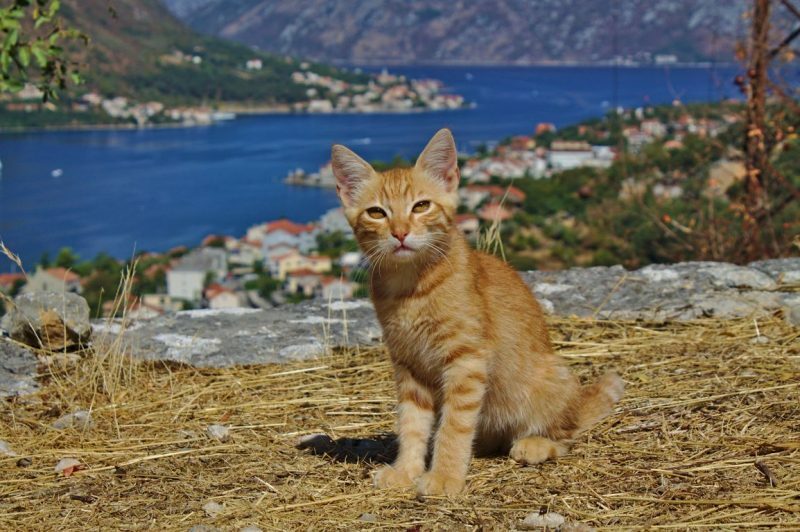 Montenegro or Crna Gora (Black mountain) is the first ecological state ever, meaning that the country established a legal paper to protect its nature and the rare species of animals. Montenegro covers ancient forests with trees more than 500 years old, crystal clear rivers and wide ranges of landscapes that are completely untouched by humans and instead ruled by bears and wolves. Budget-friendly time to travel: Before or after season. Only in the periods before June and after August you can experience decent prices for accommodation and food. 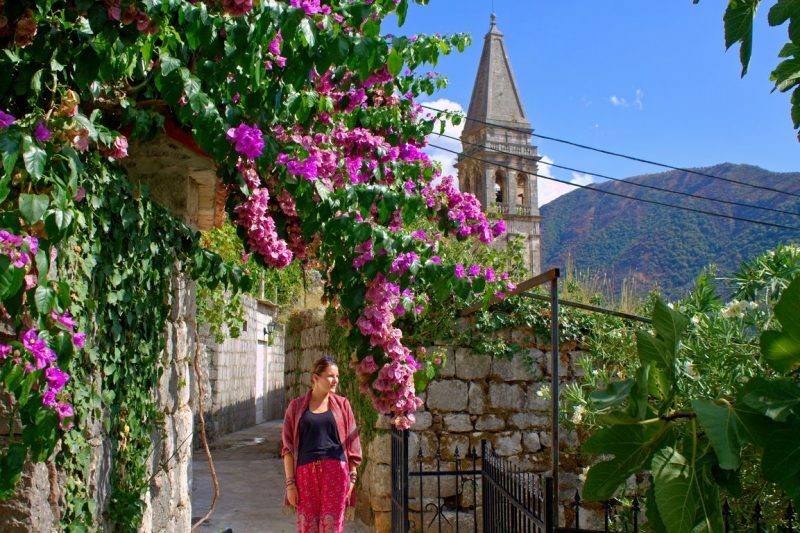 After exploring Bosnia and Herzegovina for several weeks, we continued our travels further East which led us to its neighbor country Montenegro. Doing some research we were convinced to start our journey in the coastal town of Kotor. Studying the map, Mostar is about 3 hours from Kotor. However, our bus driver didn’t take the direct route. Instead, we drove all the way to Podgorica – all the way in the East – to turn back around to continue on the coast via Budva (in the center of the South coast) to Kotor. The drive cost us over 9 hours, about 5 hours more than we expected. We arrived well after midnight and headed towards the town center. Kotor’s medieval old town center is still inside well-preserved ancient walls and as we arrived at night, the well-lit narrow streets were a nice sight. Here and there, some cats were laying around and we then ended up in a little square where it was full of cats. While we were trying to get some pictures of a little kitten, it got closer to us and crawled around us. 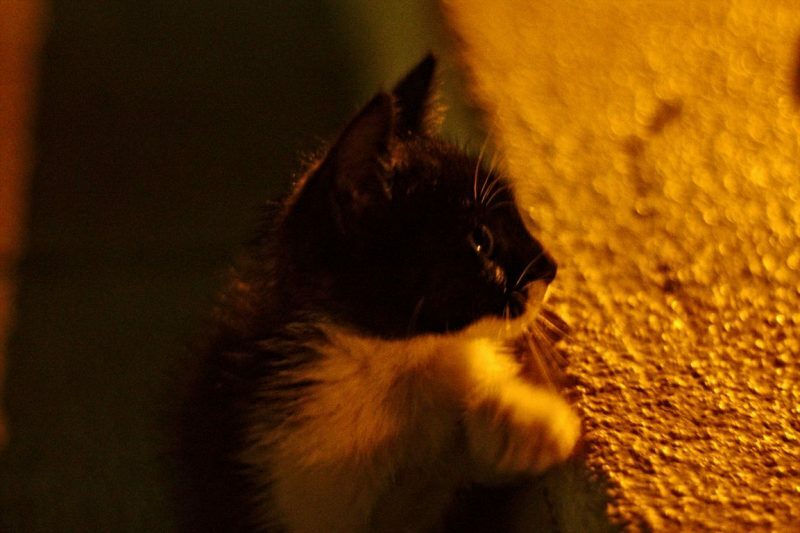 We tried to rest for the night and waited on a bench until sunrise while the kitten sat in my lap for the whole night. While we waited, a street cleaner came over to talk to us. He mentioned a hotel called Hotel Fjord, saying they let you stay for free if you don’t have money. 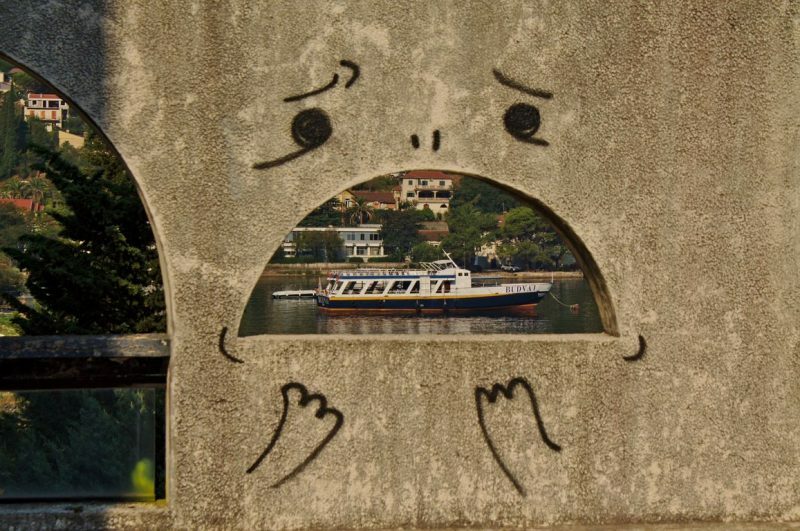 We didn’t understand him so well – he didn’t speak English much – until we went for a walk the next morning and came across Hotel Fjord along the waterside: the hotel was abandoned. The front gate to the hotel was open, with stairs leading up to the entrance. It didn’t take us long to notice that we were not the only ones here: some other travelers were just waking up after spending the night on the hotel’s balcony overlooking the bay. The hotel was huge. Every higher floor had an even better view and we didn’t even make it to the top floor. Unlike most abandoned buildings, there were still some parts that were not completely destroyed, although moss was taking hold of the carpets exposed to rain and some rooms and hallways abruptly ended where a wall or a floor was supposed to be, which makes it dangerous to explore this place at dark. From the hotel’s balcony, we could see the waterside with clear, turquoise water and enough space to relax by the water. Not many people were here. In fact, the town Kotor and places around the Bay of Kotor had plenty of space. Coming from the Croatian coast, where the country’s complete coast had been taken over by hordes of tourists, Kotor seemed very empty. We walked down to have a rest here and found there is also an abandoned pool, belonging to Hotel Fjord. The pool probably hasn’t been cleaned for a while, so to swim there may not be advisable. 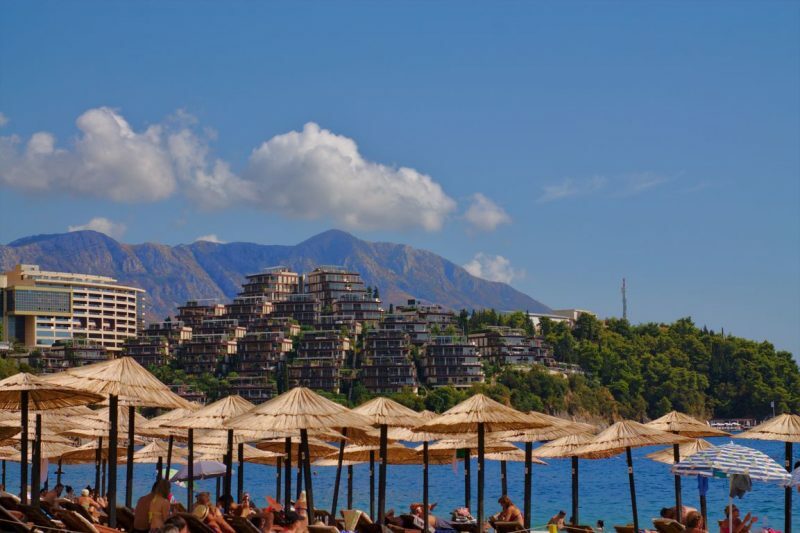 The best and cheapest option when it comes to finding accommodation in Montenegro are Sobe or Rooms. A great benefit is to speak a little bit of the local language what makes it easier to haggle out a deal. Usually the price for one night goes down the more nights you book. In our case we could haggle the price down to 8 euros per person because we accepted to stay for 5 nights. 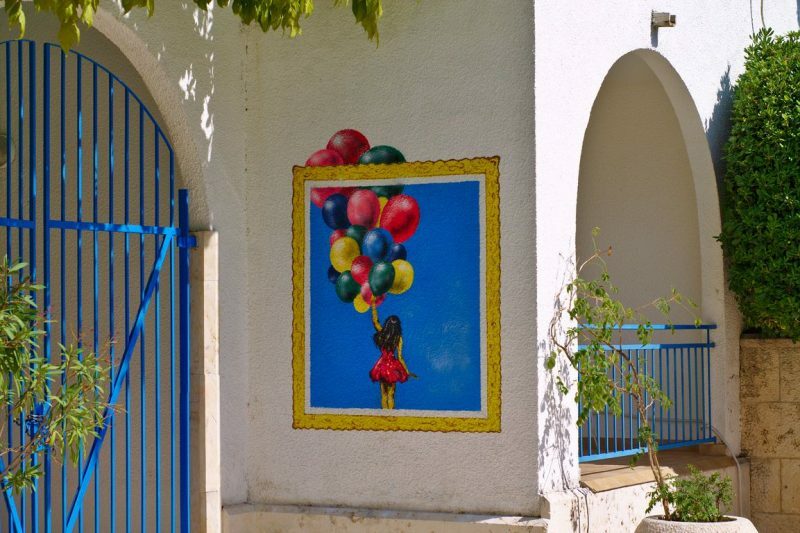 Otherwise, the price per night would be € 15 per person when taking 3 nights. 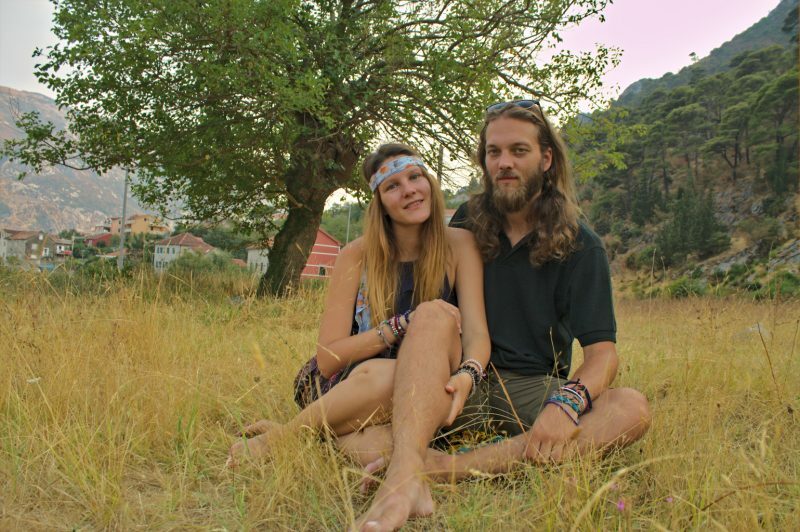 If you’re not willing to stay more than one night, the price can go up as high as € 25. 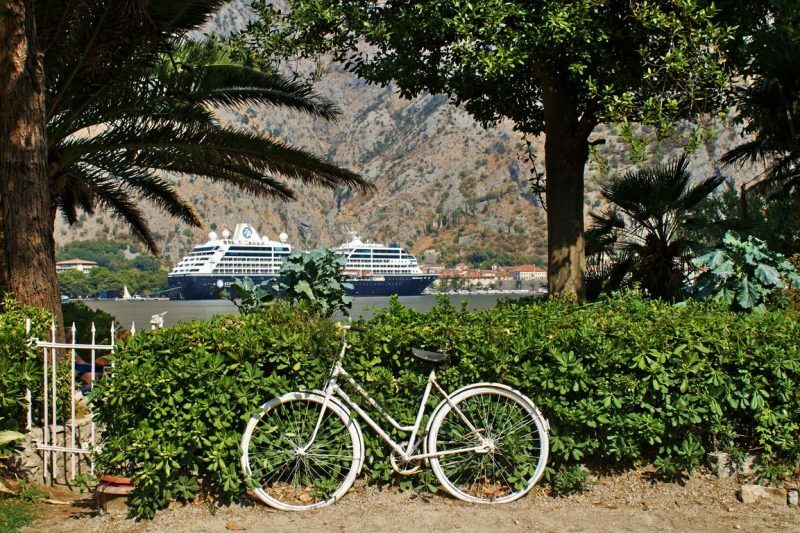 When strolling around Kotor, especially along the coastal promenade where big cruise liners berth at the port, you will agree with us on the observation that Kotor is quickly becoming the next destination for the rich. 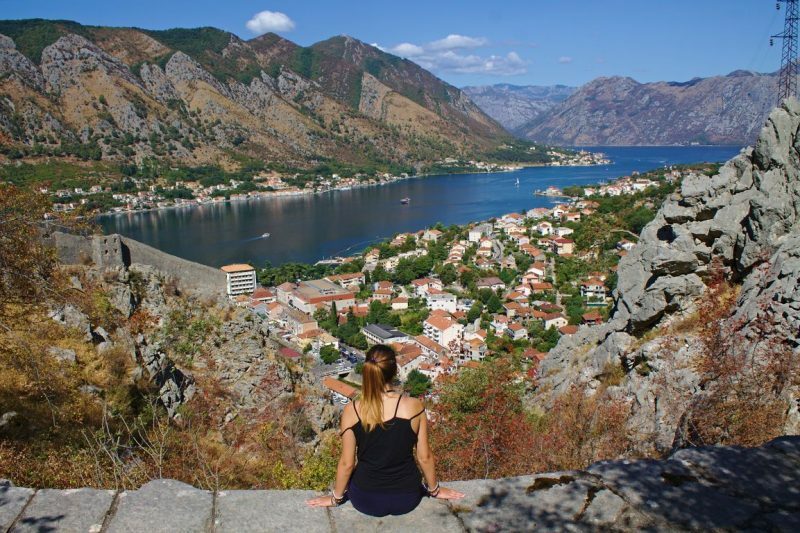 Despite that, it’s still possible to find a place to stay for a decent price, making Kotor a favorite destination not only for the prestigious but also for budget travelers. 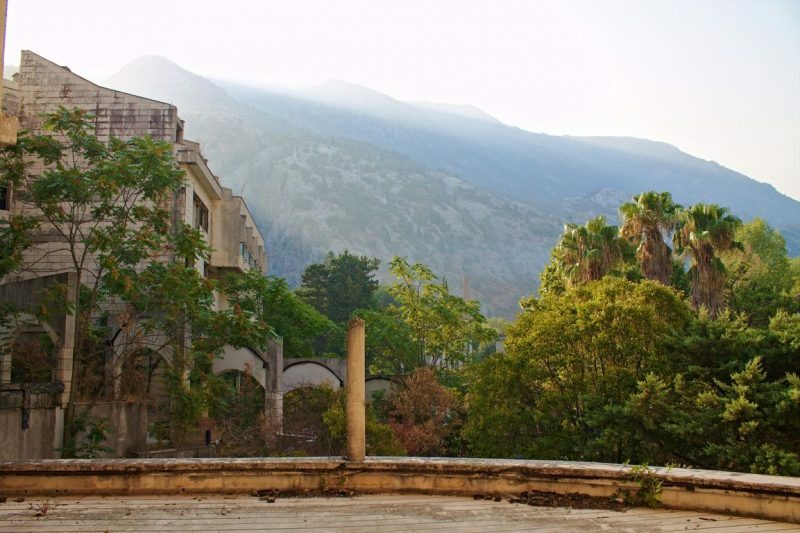 Hostels are seen as a money-making machines by locals in Montenegro and AirBnB doesn’t support the locals either, but mostly investors who only get richter. 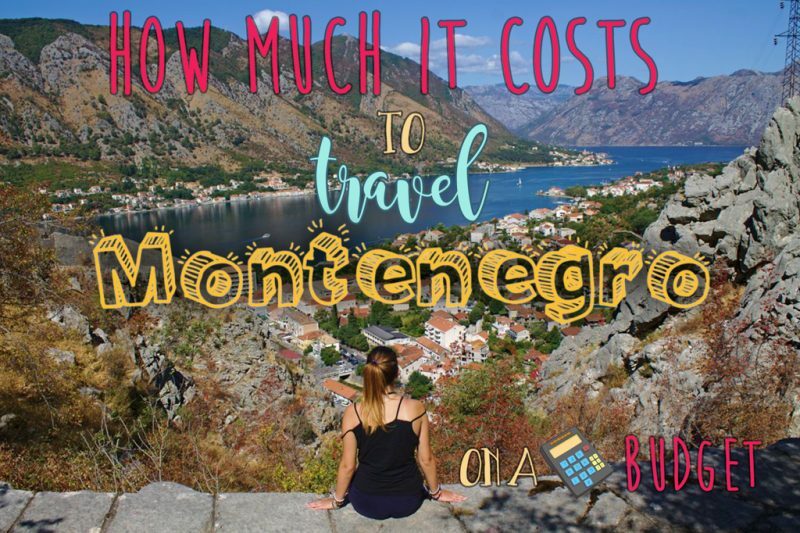 If you want to make a difference budget-backpacking Montenegro, look for signs stating „Sobe“ or ask around if somebody knows someone who rents out rooms. 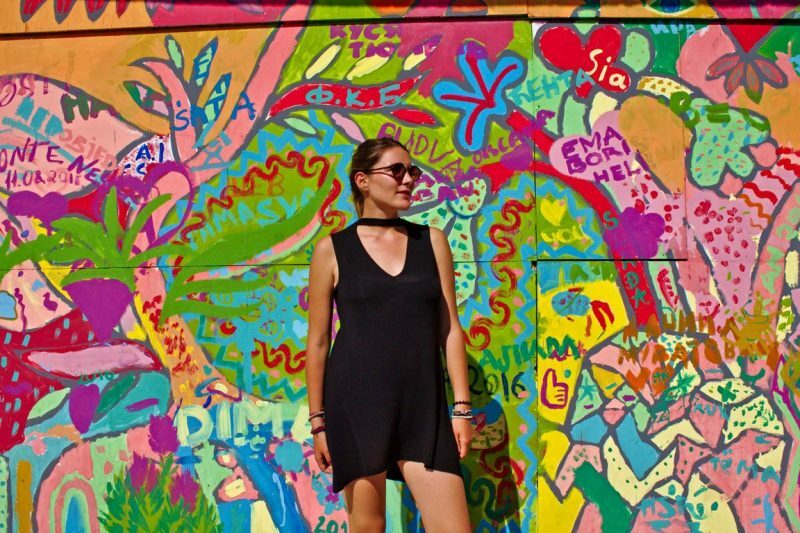 You will not only get a way better price than in hostels for one bed in a shared dorm but you will also be recognized by the locals as a budget traveler which puts you in a better position to haggle the price down if it still appears too high for you. 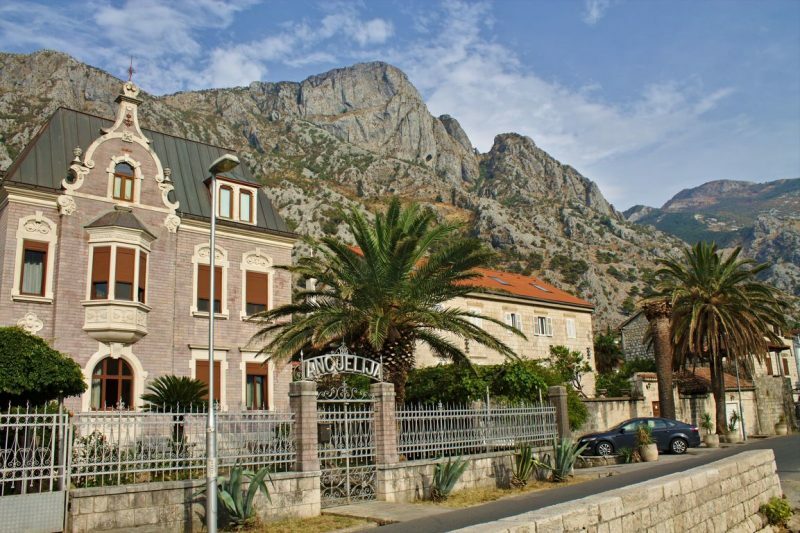 Dobrota is less than 2 km from the old town of Kotor. There is a great choice of restaurants, bakeries and snackbars with rock-bottom prices. We always bought our food and snacks there. The bus ticket cost us € 1 each, but to actually get on the bus was a long quest. We waited at our bus stop, only for the bus to pass us without stopping. Yes, we waived the driver and he could see us from afar, but he sped past us. Initially, we thought we were at the wrong stop, so we walked to the town center to take the bus from there. There are no time tables to be found anywhere, but rumor has it that the bus would either come every 15 minutes or every 15th minute of the hour. Neither proved to be correct: the bus arrived at 12:25. We left our room around 10 o’clock. 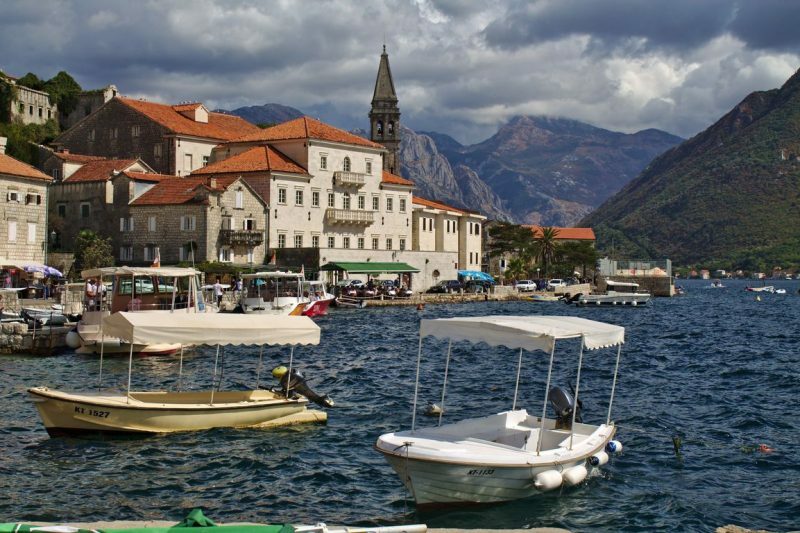 Perast is a very small town and still has the flair of a fishing town, mixed with upper class tourism. While walking around the town, we found one path going up to a little, old church from where we had a great view over the bay and the two little islands that lie not far from Perast: Sveti Đorđe and Gospa od Škrpjela (Our Lady Of the Rocks). The second island (Gospa od Škrpjela or Our Lady of the Rocks) is an artificial island, created by sunken boats and rocks. Today, it is still custom for local people to chuck rocks around the island in a ceremony called Fašinada, held every 22nd of July. Muo is on the other side of the bay and is only a small walk from Kotor. This side of the bay was even less crowded and there were plenty of spots to sit down by the waterside, sometimes we were completely alone. 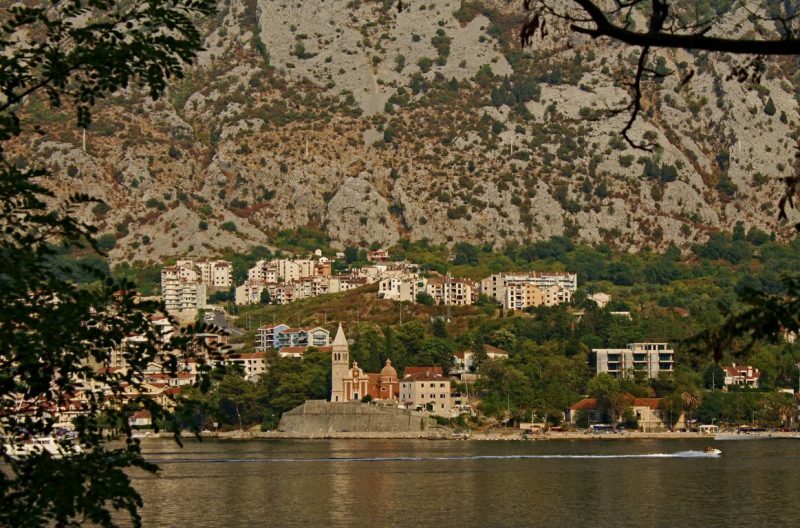 The yellow fields and mountains of Prčanj reveal another side of Kotor. 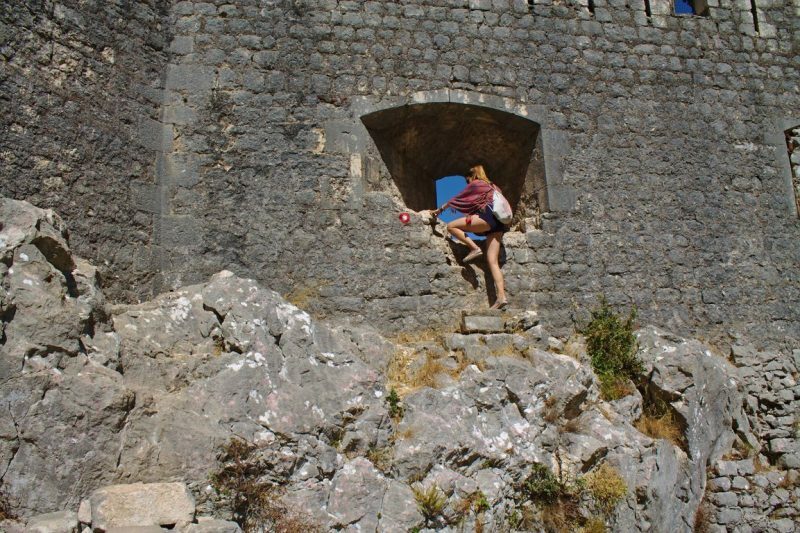 If you want to escape paying the admission fee of € 3, you should either start the hike before 8 AM or use the so-called Ladder of Cattaro to reach the fortress. It’s the Shepard trail that’s why you might come across goats herding in the hills. Unlike the paid path, this path is not steep, slippery and narrow. 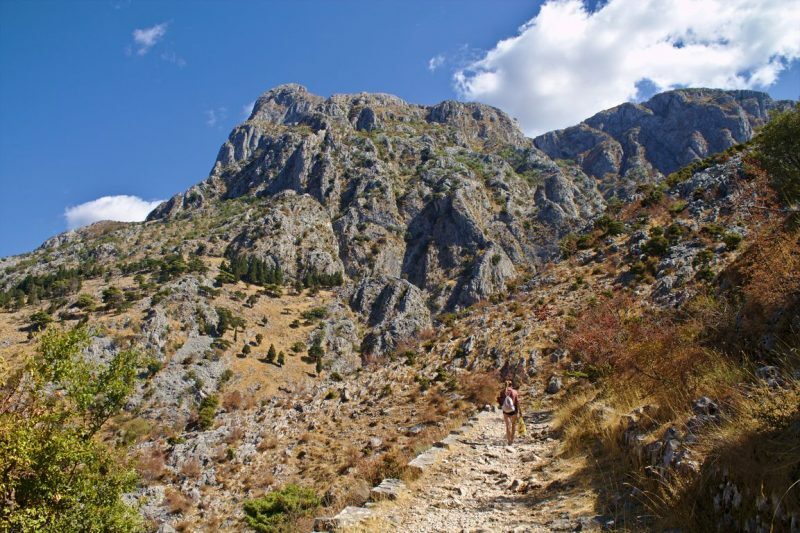 Once you leave the North Gate of the old town and pass the bridge, head towards the mountains in the back, following a stony path with switchbacks leading up to a rocky serpentine trail. 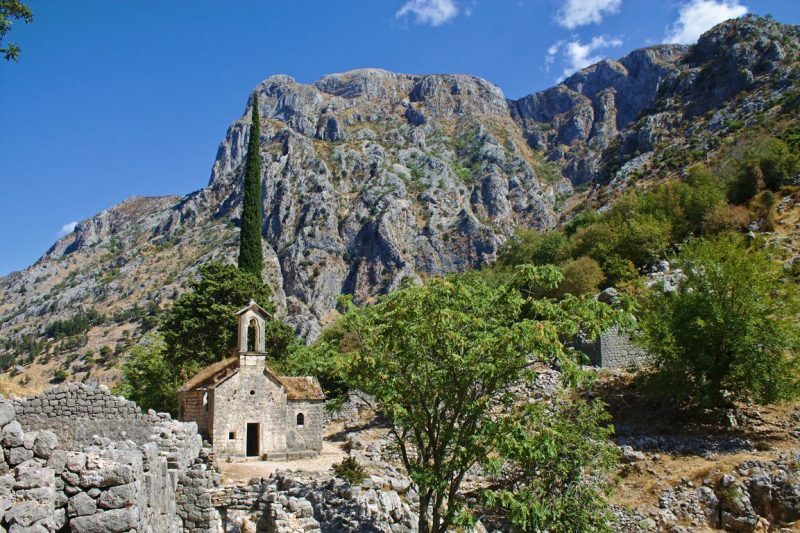 All you have to do, is to follow the winding route upwards until you reach the ruins of the adjacent village of Špiljari with a well-preserved church used as a goat shed. Continue to the top of the hill and climb through the window which is marked with a red dot. This is the place where the main route meets our alternative route. It’s more crowded from here on, but the views of the bay and the ruins below are worth the detour. After 5 relaxing days in Kotor, we packed our stuff and headed for new adventures. We read that Budva is not as intriguing as Kotor. 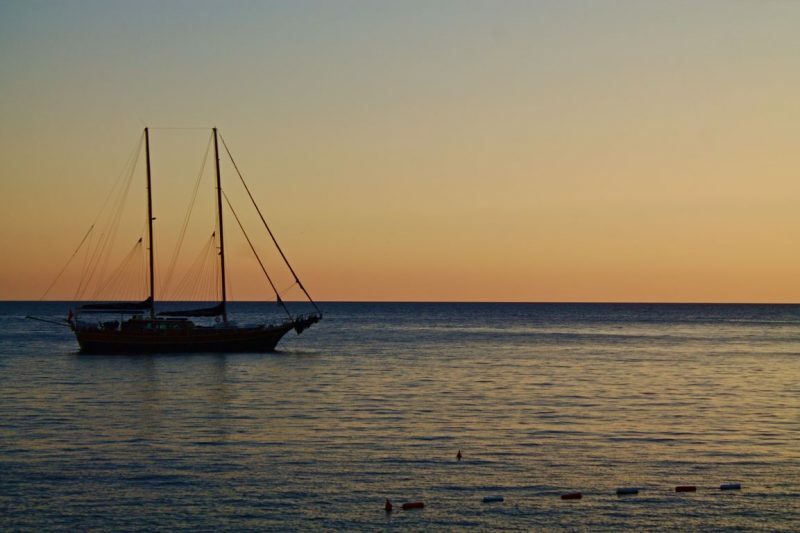 There were several negative articles condemning Budva as a place for party tourism and poor culture. We wanted to see if there was any truth to it. The bus fare should be around € 4 for a half-hour ride, but with Montenegro’s unreliable bus service and the short distance, we were motivated to try hitchhiking. Two friends from Trebinje and Kotor gave us a lift in their rusty Lada Niva. We listened to high-volume Balkan beats and enjoyed the ride along the coast. 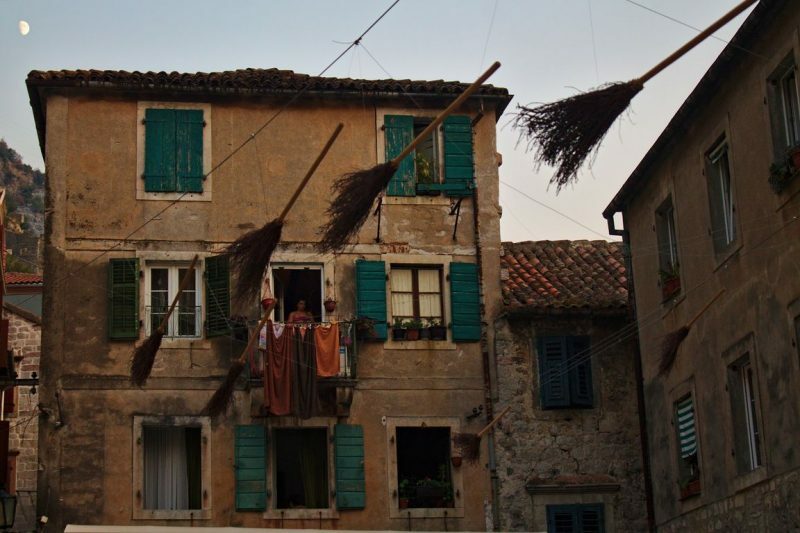 As Budva is a tourist magnet, the amount of accommodation is higher than in Kotor, making it more competitive in prices. We paid € 15 for a private room not far from the center, i.e. € 7.50 each, which is quite a good price for the first week of September. 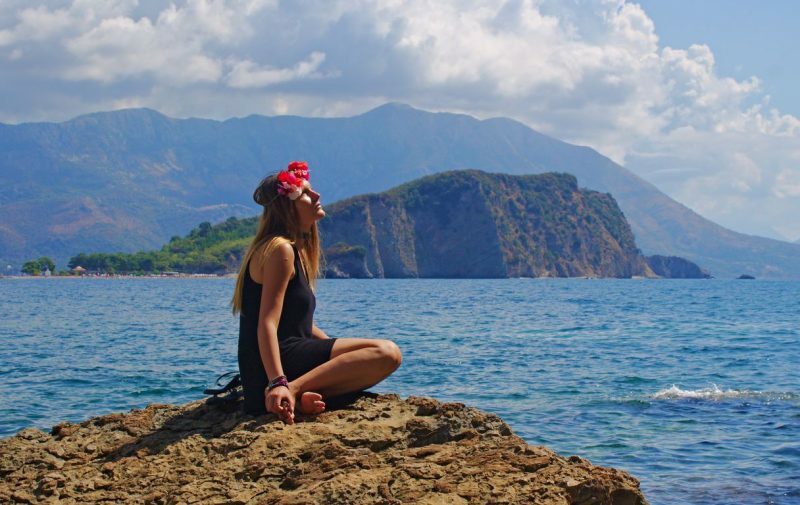 Our first impressions from Budva coincided with the experiences of many other travelers describing Budva’s beaches as an accumulation of paid sunbeds and umbrellas with little space for those who just come with their towels. 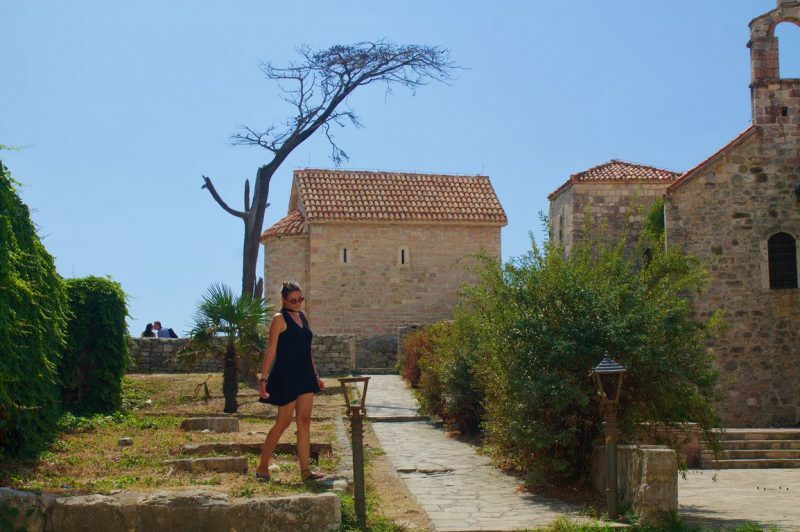 How to make your stay in Budva an unforgettable one? Despite all the first-impression obstacles, we were able to overcome them while we explored places beyond the packed beaches and noisy beach bars. Mogren beach offers scenic views over the ocean and the island of St. Nikola. If you’re in a sporty mood, explore the rocky cliffs surrounding the beach. 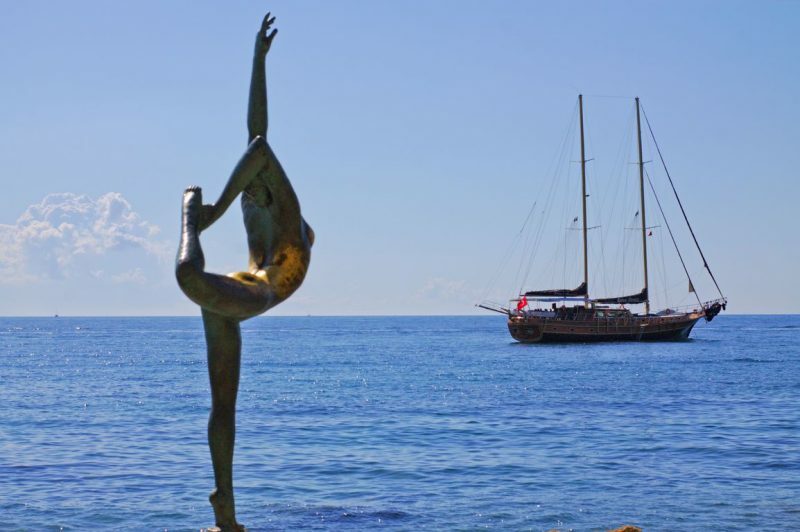 On the way to Mogren Beach you will also pass caves and a statue of a ballerina. Legends have it that this statue is the embodiment of a girl who drowned herself in the nearby waters. This hotel consists of many complexes hosting a large number of guests. The nice aspect about this hotel, however, is that its parks and walkways are open to all visitors. 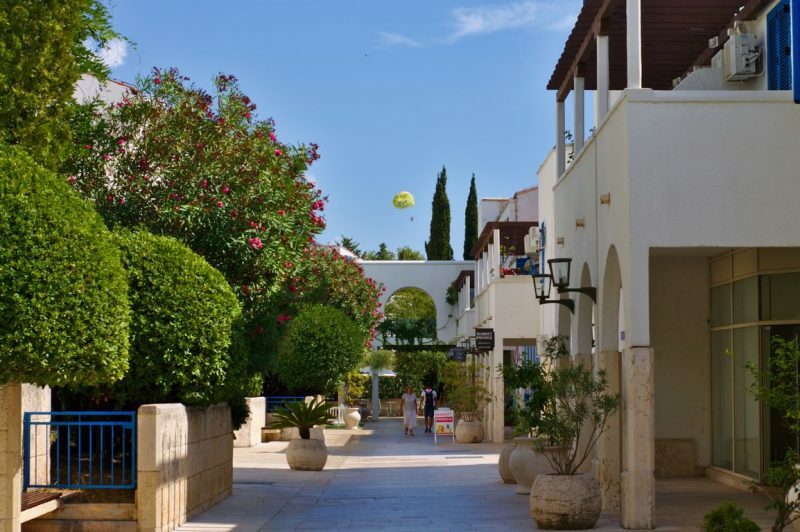 Enjoy an afternoon walk among white villas with blue painted window frames and pots of colorful flowers. 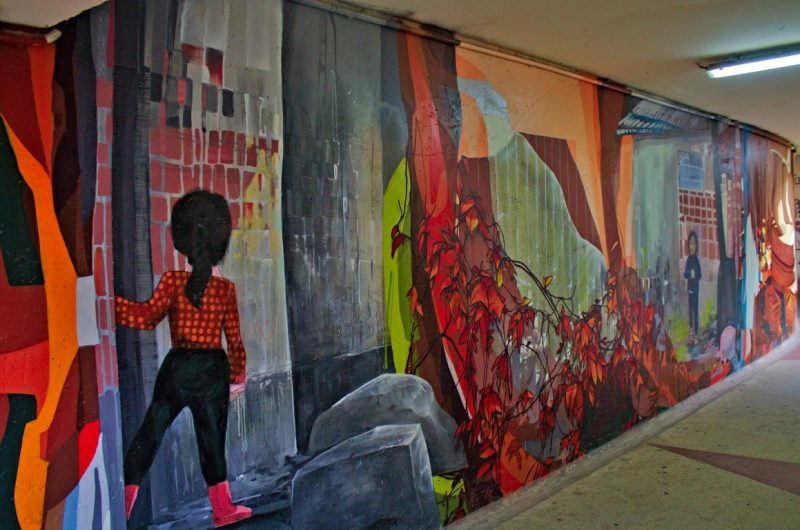 Keep your eyes peeled for inspiring artworks and little parks with benches to have a rest.